Thank you donors for making this huge success possible! 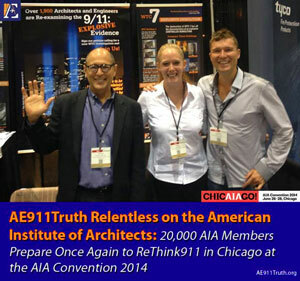 This incredible reality—that the majority of our nation's architects and engineers are oblivious to WTC 7—is one of the primary reasons that AE911Truth headed to the Windy City last month for the 2014 National Convention of the American Institute of Architects. It was the fifth time since 2008 that our non-profit organization has attended this annual event, which this year was held at Chicago's McCormick Place on South Lake Shore Drive, the largest convention center in North America. 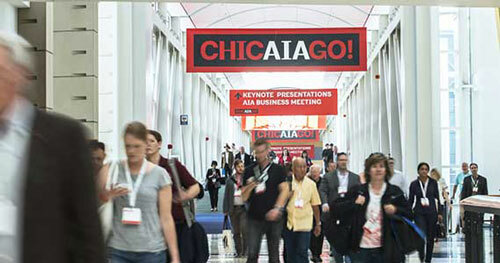 The nearly 800 exhibitors and more than 15,000 architects in attendance had an opportunity to hear AE911Truth sound a wake-up call about the impossible claims of the official story of collapse by fire of the three skyscrapers on 9/11/01. Lou Stolzenberg, an AE911Truth activist, who came all the way from Madison, Wisconsin, never let up on the passing architects. "Did you know that a THIRD tower fell on 9/11?" she would ask. "No!" was the usual response, and with it came a boatload of curiosity. The conversation was on! Thank you, our dedicated donors, for making this all-important outreach a huge success!